The eminent fellows pose for posterity after their meeting last March 1 at the DAP Building in Pasig City. Shown are (front row, counterclockwise, from left): former Secretary Corazon Alma de Leon, former Chief Justice Reynato Puno, former Prime Minister Cesar E.A. 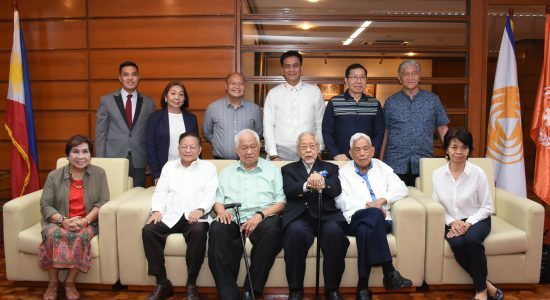 Virata, Dr. Sixto Roxas, former Senate President Aquilino “Nene” Pimentel Jr., Ambassador Laura del Rosario, former TESDA Director General Edicio de la Torre, former Senator Orlando Mercado, DAP President Engelbert Caronan Jr., senior fellows Atty. Angelo Valencia and Dr. Julieta Roa, and the Council of Fellows Secretariat’s Dr. Chester Cabalza. The Council of Fellows (COF), an idea generation mechanism of the Development Academy of the Philippines, gathered to discuss and share its thoughts on the Academy’s structure and role in the bureaucracy during a luncheon meeting last March 1 at the DAP Building in Pasig City. Former Senator Orlando Mercado expressed gratitude to DAP President Atty. Engelbert “Jojo” Caronan Jr. for inviting the eminent and senior fellows to the luncheon meeting. “This is really a big opportunity for us to share ideas and to remind ourselves of our mandate as the members of the Council of Eminent Fellows,” he said. 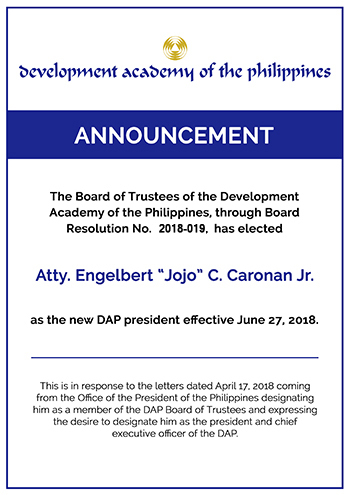 Caronan cited the Academy’s current structure, its service, delivery, and framework as his main areas of concern, and said he wanted to seek the eminent fellows’ wisdom and expertise in these areas to identify what ought to be the Academy’s core functions as an institution. He further explained that the management committee is considering the reintroduction of an approach similar to what has been done in the past. This, he said, is because the DAP has formulated its interventions or adopted a demand-driven and formulaic system in providing solutions and interventions to the bureaucracy. “We strive whenever an institution seeks our assistance to involve all centers in making a diagnostic evaluation before we offer a customized menu of interventions,” he said. 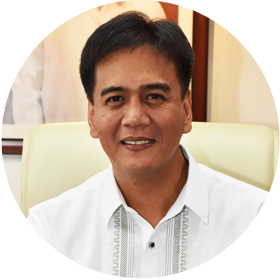 He related that he was also informed of the four different frameworks that were used by the DAP in the past, which he feels need to be revisited or developed into an altogether new one that would correspond to the changes of the times since the current framework of the DAP may emphasize efficiency, streamlining and productivity but has very little regard to innovation. Dr. Eduardo Morato, for his part, emphasized that structure should not precede strategy. He underscored the need to establish the basic services and products that must be delivered by the DAP to the government community to identify the kind of structure that will best relate to that. Mercado, meanwhile, also highlighted the need for a massive digitization and information technology upgrade for the Academy. Dr. Sixto Roxas, on the other hand, stressed that there is currently a great deal of alarm on the state of agriculture in the Philippines and that the DAP should determine its contribution to address this serious problem, saying that the government has addressed the sugar and rice problems by importing both commodities. 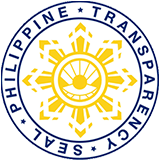 Dr. Julieta Roa noted that the DAP is the think tank of the government as stated in its original document. She, however, said this has been diluted over the years because instead of the bureaucracy going to the Academy for help, it has instead gradually turned more to the private sector for that assistance that the DAP should be providing by way of solutions to its problems. She then said that it is important for the Academy to have a developmental paradigm in order to guide the bureaucracy on how to deal with poverty. Former Senate President Aquilino “Nene” Pimentel Jr., meanwhile, said that the DAP should feel free to discuss issues that confront the problems existing at this time and allow those who disagree to state their views while publicizing what the Academy is standing for. “There is absolutely a need for the mass media to pick up what we are saying,” he said of what the Academy needs to accomplish. He emphasized that the DAP should be able to reach the masses. This, he said, is because such a connection can lead to the development of the nation, as real development takes place not in putting up infrastructures but in developing a country’s human resource, its citizens who are empowered and who can maximize their rights.